Wendling Quarries, a large operation based in the American Midwest, runs around 100 quarry sites that handle a wide range of aggregates, as well as recycled products. With two stationary and five portable crushing plants, four stationary wash plants and two more portable, and a pair of hydraulic dredges, Wendling moves a lot of material – more than a half-million tons a year from some of the larger quarries alone. For project manager Rob Manatt, that meant a lot of stockpile management and, even with technology chipping in, that meant a lot of hiking. "We had a Trimble GPS system, so we had a handheld and a stick with a rover on it, and then we had AutoCAD Civil 3D, so we would go and physically walk the site. You'd walk around any given pile and measure the base elevation, then walk around and over and on top of the pile to get all the contours of the pile itself," he said. "Then you'd do that for all the piles on the site, take that information back and upload it onto the computer." For Wendling, that meant a full day of surveying on some larger sites with multiple products being mined, followed by another day of processing to get that information back. When the use of drones began to grow in other industries such as agriculture, Wendling took notice and decided to look into using the emerging technology. One of Wendling's sister companies purchased a drone system and tried it out, finding a number of issues that needed to be dealt with. "We liked the idea – no more climbing up piles and all that nonsense – but we didn't like the execution and the way it was working for them, the costs and hassles of managing your own drone system," Manatt said. Change is often a challenge in long-established industries like aggregates, he noted. "I heard a quote the other day that we're 50 years behind where we could be in terms of utilizing the latest and greatest technologies. I would say we are probably on the early adopter part of the curve for the aggregates industry when it comes to that," Manatt noted. In Wendling's case, that started in a conversation with a representative of Kespry. The drone operations developer offered up an opportunity to reduce the need to hike the site to gather volume data from stockpiles. 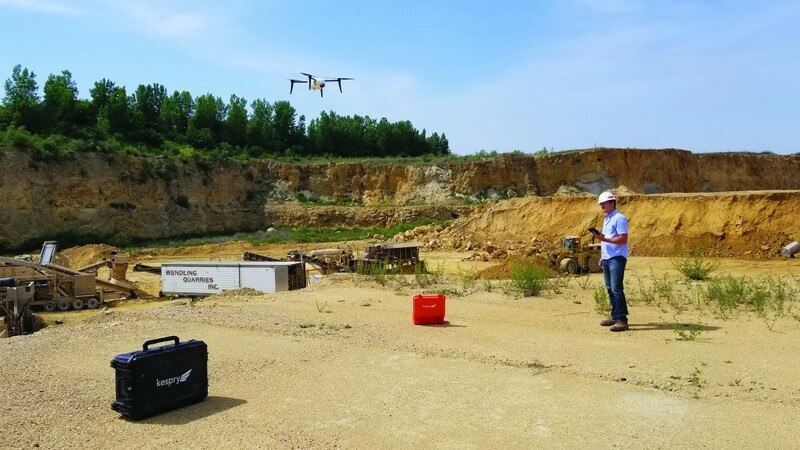 The Kespry system has always been very simple to use – it consists of a control box, the drone and an iPad, and Manatt said that for stockpile measurement it takes a few minutes of setup on the tablet to be ready for flying the drone. "You set your flight height and a few other parameters, check the area for safety, and push go – the drone starts up, flies, does its thing, comes back, lands itself and then you just turn it off," he described. Once the drone has finished its flight, that information is uploaded to the Kespry cloud and processed, providing precise volumetric information. However, at the same time, there is other information collected – information that can be used to expand the ability of operators to manage their sites. Manatt said Wendling was using some of that data for its own operations, but Kespry has recognized the benefit of additional knowledge from the drone flights and has launched a new set of tools – its Site Planning Toolkit. Intended to improve profitability, productivity and safety for aggregates and mining operations, the new toolkit uses information captured during drone flights to dig deeper into the condition of the quarry than ever before. Using the new toolkit allows customers to create, track and analyze the process of earthworks, extraction and safety work in their sites, all continuously updated through drone flights. "A site planner can actually look at data in the Kespry cloud and make decisions rather quickly," related Jason Nichols, product marketing manager. Because Kespry's drone system is based on a subscription business model, operators can fly their drone as many times as required to gather the information they need, which Nichols said makes decisions easier and smoother. "You have unlimited access to the data through this package, which really enables our customers to expand out and put more money back into their pockets, just by getting that data turned around quickly," he said. Kespry offers a cross-section tool that automatically generates elevation profiles and compares that profile to data either from previous flights or from a design plan. "Within this tool, you can actually evaluate where you are as far as distance and elevation . . . you can see what was moved when, and how far the progression has gone over that period of time," Nichols explained. "That optimizes the ability to make decisions using both the visual tool and the volumetric tools." In addition, the new package provides 3D volume modelling, which allows users to create a 3D polygon when calculating the quantity of material to be removed for proposed excavation work. The third part of the package is Kespry's compliance and safety tool, which uses technology within the cloud to detect, monitor and alert users of issues arising around haul roads, berms and benches across the site. "We use our artificial intelligence and machine algorithms to identify where haul roads are, the height of the berms, and other factors and send alerts when thresholds are breached," Nichols said. "That allows managers to identify problems, go out and correct issues to help comply with the regulations for that particular site. It enables them to make actionable decisions without having to rely on additional resources." For Wendling, the new tools are proving to be useful in a number of ways, Manatt said. "We use the Kespry software a lot for our earthmoving - when we hire stripping contractors to remove overburden, we do a pre- and post-flight to calculate the volume of material moved out. This new toolkit has the capability to track progress as they're going along," he said.